In 1992 Paul put out his first vinyl offering – the white label ‘Love Rush’, a Trade anthem. He then hooked up with Hooj Choons’ Red Jerry and came up with the dance classic “Rock Da House,” (later to be re-released in 1997 on VC Recordings, reaching No. 11 in the national charts.) This dance classic is set for 2008 remix release later this year with mixes to from Fedde Le Grande. Paul then went on to produce numerous top 10 hits including the club anthems Escrima “Deeper” and “Train of Thought”, and his highest entry to date, Camisra “Let Me Show You”, entered new at No. 5. All this lead to a series of remix projects for artists such as New Order, Stone Roses, Erasure, Human League, K Klass, Wild Child, , Energy 52, Duran Duran, Nalin & Kane, Blondie, Bizarre Inc, more recently , Keane and The Killlers… the list goes on. Paul’s production talents are recognised in the “DJ Magazine Top Producers Poll. 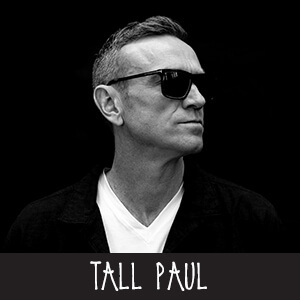 Paul has continued his own production success with tracks “Common Ground”, “Be There”, “Freebase” “Precious Heart” and “Everbody’s A Rockstar”, both of which feature on Paul’s debut artist album “Back & Forth” released Duty Free which continues to confirm his reputation as being one of the key players in the UK dance scene. Paul won the much coveted “Muzik” DJ of the year.. and numerous “best remixer” best producer” awards. His popularity has seen him DJ world-wide travelling to the U.S., Canada, Japan, South America, Asia, India, Dubai, South Africa most recently in Australia and all over Europe. When not jetting around the worlds he has been busy in the studio and has just launched a new residence concept at the Ministry of sound at his night ‘The Gallery” which is the longest running weekly night in London and the world. The new concept is called the Beat Technique. A mixture of classics, new music and the lastest Dj technology to create a unique experience. Currently pushing forward with Cream, Colours, Clockwork Orange and Gallery events and the Classical orchestra experience.